It’s a chilly Friday afternoon and Daniel Williams is headed to Fort McCoy, Wis., for his monthly weekend of training with the 45th Infantry. A reservist for seven years, Williams also served a tour in Iraq and Kuwait. He has since traded in his combat boots for dress shoes and works as a student liaison at the DePaul University Office of Veterans Affairs while completing a degree in digital cinema. But cinema doesn’t seem to fit into Williams’ future, as he said he plans to reenlist. “This is what I was born to do,” Williams said. That sentiment is common today, as many veterans are now bypassing the transition into public sector civilian life. Instead, they are staying in the armed forces as a career, sometimes even taking a pay cut to do so. Punching keyboards, keeping up with payroll and dealing with human resources issues doesn’t exactly sound like the typical thrill-seeking military job description. But for many veterans returning to a volatile civilian job market, that’s exactly what they are looking for. 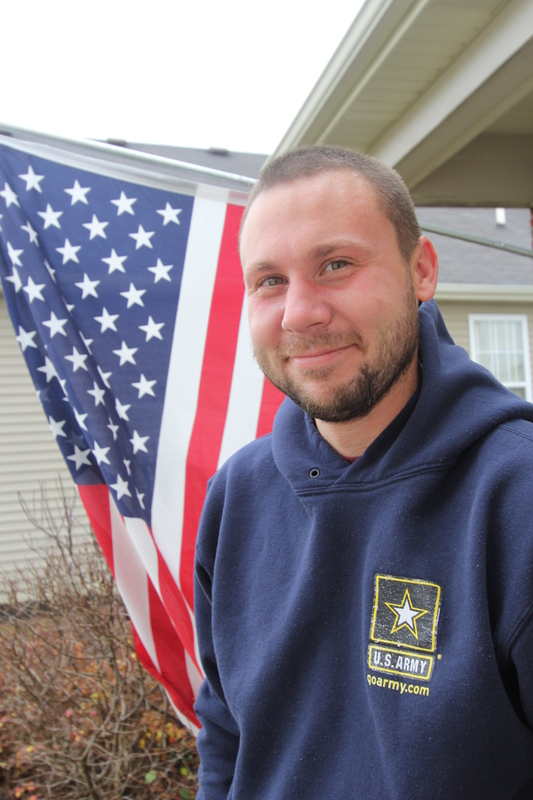 Young veterans returning to Illinois face an especially difficult road to employment. Illinois has the fourth highest unemployment rate for veterans, according to the Heartland Alliance's Social IMPACT Research Center. Bucaro will enlist indefinitely in December, after serving nearly 12 years in the Army Reserves, including one tour of duty in Afghanistan. His civilian job is unit administrator for his reserves unit, managing solider pay, personnel actions, supply actions and advising his commander of actions to take. After graduating from Carthage College with a degree in accounting and human resources, Bucaro worked as a manager at Steak and Shake, earning more than $40,000 salaried pay. In July 2009, he left that job to work as a human resource assistant at the Veterans Affairs office in Milwaukee, making nearly $8,000 less. Within seven months in the VA office, Bucaro was recommended to the administrator position he has now. He works 40-hour work weeks with 10 paid federal holidays off, plus vacation time. Three times a week, he gets paid to work out in the mornings and then goes to the office in his sweats. Bucaro knows that he’ll be home by 4 p.m. to eat dinner with his wife. He said his wife is fine with him indefinitely enlisting in the reserves except the chance of deployment, but that’s a chance he takes. As dangerous as deployment is, sticking with the Army might be Bucaro’s safest route for employment as opportunities are abundant. According to their website, the reserves account for approximately 20 percent of the Army’s numbers. Illinois veterans in their 20s face unemployment rates of 12 percent, according to a recent study by the Social Impact Research Center. Illinois’ non-veteran unemployment rate is just over nine percent. The same study shows that for employed Illinois veterans the most common occupation is a military-specific one like Bucaro’s as a military technician. Many in the armed forces do not gain skills that are transferable to civilian employment. For example, those trained only in infantry skills — the combat skills many people associate with soldiers – have a more challenging time finding work in related fields. 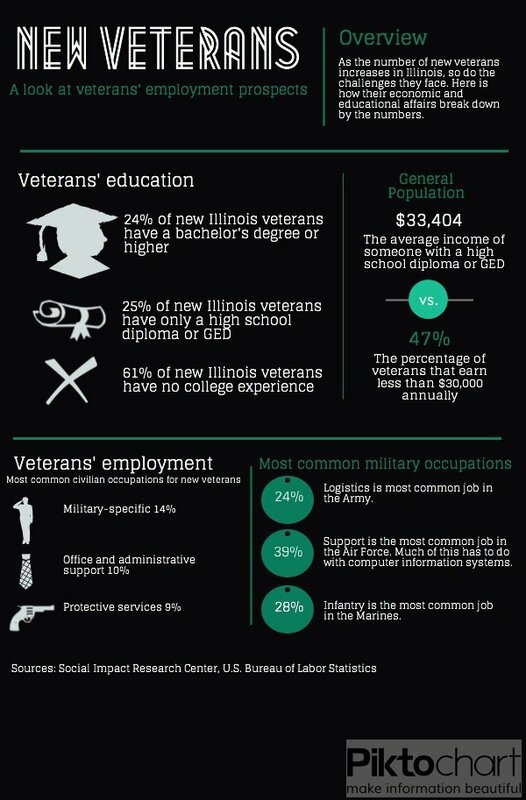 According to the Social Impact Research Center infantrymen (women are not allowed in this specific service) account for 17 percent of new Illinois veterans, and only six percent of them find work in related fields like criminal justice, security and fire protection. Not only does being a reserve provide employment, it can be a lucrative decision. “From the reserves alone I make an extra $10,000 on top of my civilian pay,” Bucaro said. Like Williams, Bucaro must also take part in monthly drilling with his unit. Reservists receive their “drill pay” for completing two weeks of training per year and monthly drill sessions. Pay is based on experience and rank. A major in the reserves with six years of experience can earn as much as $11,934 plus bonuses for these drills. That is on top of pay for their civilian job. Considering 46 percent of new veterans make less than $30,000 annually, that’s not a bad take home. Bucaro’s decision to reenlist indefinitely also allows him to retire with benefits after 20 years of service. But making a career with the military doesn’t always mean being in the military. For Jeremy Giacomino, 27, a former sergeant in the Marines, honorable discharge meant a new career path helping soldiers transition from active duty to civilian life. Giacomino, like Williams, is a student liaison at DePaul University’s Office of Veterans Affairs. For the veteran of tours in Iraq and Kuwait, helping the armed forces doesn’t involve weapons training but instead involves getting veterans jobs training and educating them on how to navigate college and getting their benefits. Even though he is technically a civilian, Giacomino says his work makes him anything but. “I’m always going to be a Marine no matter what I do, “ Giacomino said. For now, he has to budget his time between an economics degree and working with veterans for 25 hours a week. But Giacomino wants to continue to make his efforts with veterans a full-time occupation. Although their military careers have taken different forms, Giacomino, Williams and Bucaro have one thing in common -- a feeling of fraternal loyalty to the military.